Looking for a budget-friendly place to stash all your teen's favorite reads? This bookcase fits the bill! 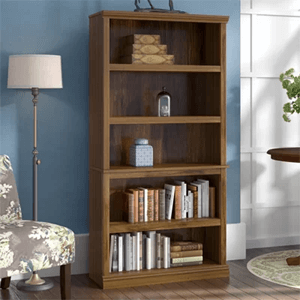 Measuring 69.75'' H x 35.25'' W x 13.25'' D, its five shelves are adjustable, so you can find the perfect fit for your teen's novels, photos with friends, and other decorative objects. Made in the USA, its manufactured wood frame comes in a variety of neutral finishes perfect for blending in with any color palette you pick.